A cake smash photoshoot in Dubai is a great way to celebrate your child’s birthday. Here’s how to make the shoot creative and fun. Have you seen people posting “awkward family photo” style pics online? The hilarious shots range from ugly sweaters and terrible haircuts to cringe-worthy poses and bad lighting. These traditional shots were all the rage back in the 90s. 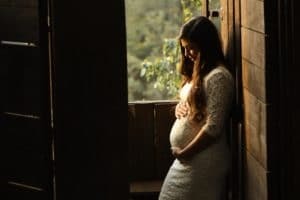 But now, parents are stepping away from stiffly posed photography and are opting for something more creative! 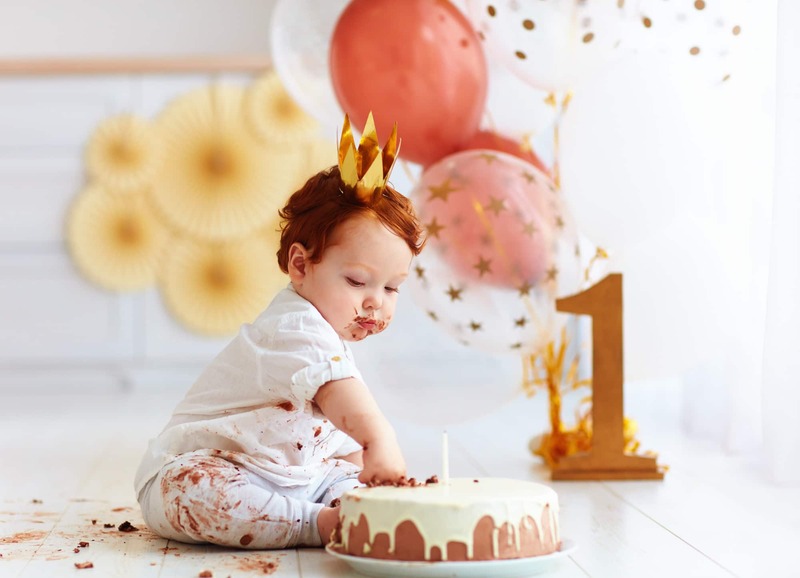 According to The Star, “parents are bypassing formal portraits in favor of unpredictable messy sessions.” And what’s more unpredictable and messy than a cake smash photo shoot? Cake smash pics are set-up photo shoots where you give your baby or toddler a cake to taste, touch, and ultimately, destroy! Follow these 8 tips and your cake smash photoshoot in Dubai will be a piece of cake. Are you ready? Let’s smash this! Smash the cake photos are an incredibly fun and unique way to mark your baby’s first birthday. While it’s fun and messy, it’s always best to take the cake smash pics before the actual party day. This will help you to get the best shots without neglecting party guests and their babies. Sure, you can have another cake at the birthday party. But because you’ll already have the perfect snapshots, you won’t need to worry about messy photoshoots and the cleanup. On a normal day, you would most likely feed your little one in a plastic high chair. It might be practical, but it will look terribly mundane in your cake smash photos. If possible, try an outdoor cake smash photo shoot. When your toddler flings cake and frosting everywhere, you won’t worry about the mess. Choose a color theme for your smash the cake photos. This will affect your backdrop, props, outfit, and of course, THE CAKE! Start with one key color, then add complementary hues. For example, start with the outfit or the color of the cake frosting. Try to avoid a white frosted cake. It can be hard to capture nicely in photographs. Something with pops of color will stand out more in the photos. Another great way to choose a color palette is to plan a theme around a favorite book or movie character. Well-known characters usually have a color scheme that goes along with them. For example, Disney characters from Frozen or Dr. Seuss from the book series are great themes for first birthday parties. Unless you’re having an outdoor cake smash, you will need to think about the background. The background could be as simple as a block colored wall or a sheet or fabric taped to the wall. Solid colored backgrounds work best as the main focus will be on the little cake smasher, not a gaudy backdrop. Some photographers use seamless paper to create a solid color look from the wall to the floor. You should make sure it matches your color scheme too. Background neutral colors look great if you dress your little one in bright colors with a vividly hued cake. The most important prop in your cake smash photo shoot is the cake. But you can add other props to complement the photos. Always remember, less is more when it comes to props. Don’t overdo it or the focus will be on the props, not the baby. 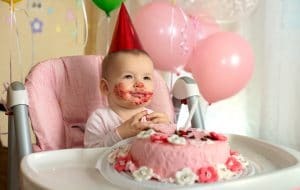 Have you ever given your baby an entire cake to smash and play with before? Probably not. This means you don’t know how they are going to react. It can make them feel overexcited or even overwhelmed. Some little ones may not like the idea at first and may start to cry or have a tantrum. 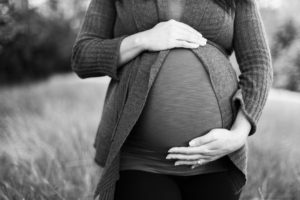 Other babies and toddlers might not know what to do. They may not understand and just poke the cake with their finger. So, you may need to give them a helping hand in the beginning—a little taste test usually works! Don’t forget to give the photographer plenty of time to get those perfect snapshots. You can either buy a cake or make it yourself. Be sure it looks aesthetically pleasing. The cake is the main event, after all. Chocolate cake may get your taste buds tingling, and it does show up clearly on photos. But using chocolate cake can sometimes end up looking like splodges of mud…or worse. You might not end up with the effect you planned. Opt for a light colored cake instead with pops of bright colors. And make sure to have plenty of rainbow sprinkles on hand! 8. It’s Going to Get Messy! It’s going to get messy, there is no denying it. But you should never start your cake smash photos without a cleaning plan. Even if you’re planning an outdoor cake smash, you need to keep the clean up in mind. Looking for a Cake Smash Photoshoot in Dubai? As we’ve established, cake smash pics are essential memories that you’ve got to add to the album. Follow these tips above, have a smashing time, and you will treasure your unique photos for decades to come. If you’re looking for a cake smash photoshoot in Dubai, you’ve come to the right place. Find out more about our cake-tastic photo package here.